Early in the eighteenth century the Wai-o-hua under a great fighting chief Kiwi Tamaki occupied Maungakiekie (One Tree Hill) pa and ruled over the lands of greater Auckland. It has been estimated that four to five thousand Maori lived and worked in the vicinity of the pa alone. A battle was fought at Titirangi between the Wai-o-hua and the powerful Ngati Whatua. Kiwi Tamaki was killed along with many of his paramount chiefs and thousands of warriors. Leaderless and completely routed the Wai-o-hua fled and the Ngati Whatua occupied their territory from about 1750 onward. Captain James COOK circumnavigates and charts the North and South islands of New Zealand, claiming possession of New Zealand for Britain. 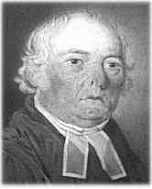 Samuel MARSDEN establishes the first mission station in New Zealand at the Bay of Islands. In November 1820 Samuel MARSDEN, together with the Reverend John Butler and native guides travelled by way of Epsom walking through some miles of bush, over stony ground and small hills to Onehunga. Here he found a small settlement of Maori and renewed his friendship with Te Kawau. 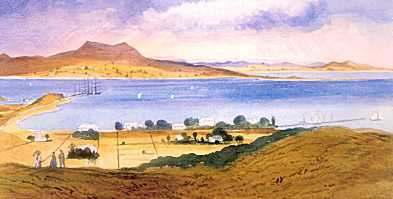 After further exploration he recorded in his journal that Onehunga would be a very suitable site for a mission station and trading post for there were fine stands of timber down to the shore line, good soil intensively cultivated and quite a large population round the coast of the harbour. In the following years, incessant fighting between the tribes and two devastating epidemics reduced the population drastically and so in 1821 when Hongi Hika swept down from the north with his Ngapuhi fighters, armed with muskets, little effective resistance was possible. Hongi Hika killed the inhabitants and laid waste the land. Many of the survivors fled to the upper Waikato and the protection of Te Whero Whero, others retreated to their ancestral grounds on the Kaipara or lived in small isolated groups near the sea. One of these settlements was at Onehunga near the foot of the present Princess Street and two others were on the south shore of the Manukau opposite Onehunga. In 1827 the Ngati Whatua formed an alliance with the Manukau tribes and in a battle at Tamaki Heads defeated the Ngapuhi and drove them from their lands. French navigator and explorer Captain DUMONT D'URVILLE came overland from the Waitemata in 1827 to the Manukau. He observed that there were few inhabitants and the land neglected and overgrown. See the biography online: Dumont d'Urville, Jules Sebastien Cesar. Charles Marshall, a flax trader from Port Waikato told of Captain Smith who sailed his brig "Tranmere" into the harbour in 1831 with the Waikato chief Te Wherowhero aboard. See the biography online: Te Wherowhero, Potatau. By 1835 more and more of the Ngati Whatua had returned to live in peace under their chief Te Kawau, the same Te Kawau who fifteen years earlier had welcomed Samuel MARSDEN. The first European settler on the Manukau Harbour was Thomas MITCHELL, a timber merchant from Sydney. In 1835 he settled near Puponga Point, built a house and what is reputed to be the first sawmill in New Zealand situated somewhere in the vicinity of Mill Bay. He believed that he had legitimately bought from Te Kawau (Ngati Whatua leader) and other chiefs the many thousands of acres of the Tamaki isthmus together with the exclusive right to the timber. When he died two years later the trustees of his estate sold the land to Captain William Cornwallis SYMONDS, the agent for the Waitemata and Manukau Land Company - See The dream that was Cornwallis. Captain HOBSON was subsequently to reduce their claim to a mere 1900 acres around Cornwallis. 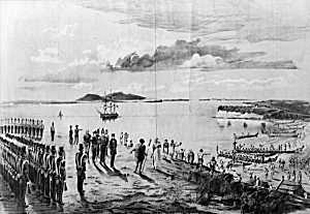 The first settlers for Cornwallis arrived in October 1841 in the ship "Brilliant" making this the first organised settlement on the Manukau. It was a venture that never really got off the ground and after Captain SYMONDS was drowned crossing the harbour the situation worsened until by 1850 not one settler was left. See the biography online: Te Kawau, Apihai. The Treaty of Waitangi is signed (Bay of Islands), and British sovereignty is declared. Governor Captain HOBSON with members of his staff walked across from Auckland. Accompanying HOBSON was the first Surveyor-General of New Zealand, Felton MATHEW. MATHEW completed a survey of the Manukau Harbour reporting favourably, that the area between Onehunga and Auckland was a very suitable place for further settlement. Governor HOBSON made the first move toward setting up a framework for local government. He issued a Proclamation providing for the establishment of the County of Eden which included the Onehunga district within its limits. 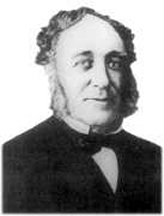 Thomas JACKSON purchased from the Maori a large block of land on which the main business centre now stands. It cost him one horse, a bridle and saddle and two pounds. In 1844 Matilda and Samuel FURLEY moved to Onehunga and established a small bakery and trading-post. Matilda FURLEY was an active partner in these business ventures. She traded with Maori from the Mangere area, bartering for their pigs and produce. Of necessity she became an expert butcher and supplied an essential service to the village. Margaret and Robert FORBES and their six children moved to Onehunga, where Robert FORBES applied for and was granted a bush licence. He established the New Leith Inn, near the beach, in a large raupo dwelling which had once been used by Ngati Mahuta leader Potatau Te Wherowhero. This was the first licensed accommodation established in Onehunga. Thomas JACKSON sold his holding to Peter IMLAY, Samuel FURLEY, Thomas HENRY. Dr. Henry WEEKES purchased from Thomas JACKSON Puketutu Island. IMLAY in turn sold some of his land to Alexander GEDDES. All of them were eventually to have a substantial part of their purchase taken away by the Land Commission and a small compensation paid. As well as the land he bought from JACKSON, Thomas HENRY bought a considerable amount of land from Te Kawau and his chiefs, purported to stretch from One Tree Hill to Waikaraka and including the Onehunga Springs. While this claim was still in dispute he sold to John Logan CAMPBELL who eventually was allowed to retain only the area around One Tree Hill. Between 1846 and 1850 Philippe Joseph VIARD - Priest, missionary, bishop - made frequent pastoral visits to established Catholic missions in the North Island, using Kororareka as his base. He visited Auckland many times, consecrating St Patrick's Church on 19 March 1848, and establishing churches for the military and their families at Howick, Panmure, Otahuhu and Onehunga at Governor George Grey's request. On 5 August, the first contingent of Fencibles under Captain William KENNY arrived on the transport "Ramillies". 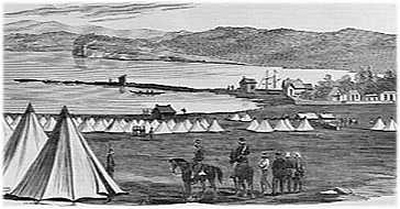 In November the "Ramillies" Fencibles and their dependents were marched to Onehunga to be accommodated in hastily constructed barracks by the Springs. Eventually everyone was housed in an area that became known as the 'Lower Settlement'. Picture: Onehunga Camp. The quarters of the wives and families of the Victorian volunteers. [1864 Calvert, Samuel, 1828-1913 engraver]. Reverend Dr. Arthur Guyon PURCHAS was appointed to the Parish of Onehunga which at that time included the districts of Epsom, Remuera, Otahuhu, Waiuku and Mauku. 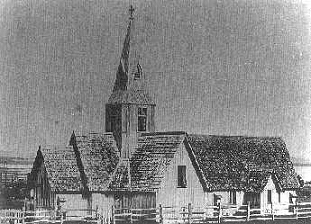 Construction begins on St. Peter's Anglican Church to a design introduced by Bishop Selwyn.Churches built to this distinctive form of architecture were known as "Selwyn Churches". A small wooden school is built next to St Peter's Church by the Reverend Dr. PURCHAS. Mr LUSK was appointed as headmaster with Miss BATES as his assistant. As well as serving needs of the people, the churches also made themselves responsible for education by providing schools and teachers. St. Peter's Anglican Church opened for worship. 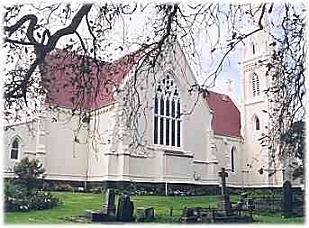 Photo: St. Peter's Church, Onehunga. In 1848 Elizabeth and Edward GEORGE moved to Onehunga with their four sons. Edward GEORGE bought land in lower Princes Street, Onehunga, near the beach, and built the two-storeyed Royal Hotel in 1848. At the suggestion of his wife he incorporated a meeting room in the plans, which provided a much needed amenity for the town and gained prestige for the hotel. Referred to as the Long Room, it was used for lectures and political and business meetings, also serving as the venue for the coroner's court. See the biography online: George, Elizabeth - Hotel owner, businesswoman, community leader. 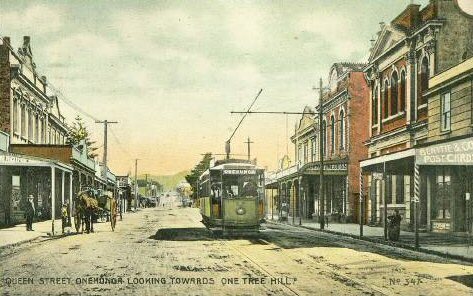 The road from Auckland to Onehunga had improved somewhat from the track via Norman's Hill through Parnell to Princes Street and to Auckland waterfront. However it still took a bullock dray a day to travel the seven or so miles on a route that wandered down Khyber Pass from the Symonds Street ridge through Newmarket and the open fields of Epsom to Onehunga. In winter it was boggy and dangerous and in summer deeply rutted and dusty, really only suitable for bullock drays and slow horse drawn vehicles. In 1849 William YOUNG, the deputy postmaster general, wrote to Major William KENNY, commanding officer of the 2nd Battalion of the Royal New Zealand Fencibles, asking him to name 'some trustworthy person' to supervise the Onehunga post office agency. As the duties were part-time, the position was expected to be voluntary. The first postmaster, William FILMER, a sergeant in the Fencibles, had declined to continue, because he had received no remuneration, and KENNY was forced to act as temporary postmaster until he could find a suitable replacement. On KENNY's recommendation Sophia BATES was appointed sub-deputy postmistress on 8 February 1849, her main responsibility being the supervision of the mail that was delivered to Onehunga twice weekly from Auckland. She 'discharged her duty very satisfactorily', and later that year Major KENNY suggested to the postmaster general that 'some permanent arrangement' be made. As a result, a salary of ï¿½1 per month was approved on 5 December 1849. Meanwhile Sophia BATES continued to teach at the Onehunga parish school, and on 29 May 1849 was admitted to Holy Communion at St Peter's Church, Onehunga. See the biography online: Bates, Sophia Ann - Teacher, postmistress. On 16 June the "Berhampore" brought the next contingent of Fencibles under Captain John Jermyn SYMONDS. Most of the "Berhampore" Fencibles built their cottages in the vicinity of Manukau Road and Mt Smart Road and this became known as the 'Top Settlement". In September the "Oriental Queen" brought the last of the main Fencible force that was to settle in Onehunga. They were under the command of Captain Theodore M. HAULTAIN and after a period in the barracks built their homes in the area now called the Te Papapa but was then called the 'Back Settlement'. See the biography online: Haultain, Theodore Minet - Soldier, politician. Father CLERY was appointed the first [Catholic] parish priest. The Royal New Zealand Fencibles were called out in an emergency when a confrontation at Mechanics Bay seemed imminent with the Ngatipaoa. Major Kenny, in response to an urgent dispatch, mustered the Fencibles on the Green Hill Reserve (now Jellicoe Park) and marched them to Auckland. The sight of so many soldiers and the diplomacy of Sir George GREY proved a deterrent and at high tide the Maori launched their canoes and returned home. Next day the Fencibles marched back to Onehunga without having fired a shot. St. Peter's Churchyard was opened for burials. The Royal Oak Hotel opened for business. Situated on the corner of Manukau and Mt. Smart Roads, the 'Royal Oak' was the first all-brick constructed building and the third public house in Onehunga. The staircase was allegedly carved by John Alfred LLOYD. By the mid 1850's Fencibles who had served their time, together with settlers from numbers of immigrant ships who had taken up residence in the area, formed a sizeable population of over one thousand people. Memorial at St. Peter's Church, Onehunga. Capt. Thomas Wing Captain William LEWIS, Pilot and Harbourmaster for the Manukau Harbour, left his position at Whatipu in April 1857. He was succeeded by Captain Thomas WING who held the post for some 30 years. With the advent of steamships the Manukau Harbour became an important anchorage, and it was a vital link between Auckland and the theatre of war during the Taranaki and Waikato conflicts. However, the harbour had serious navigational shortcomings which were highlighted when the Orpheus was wrecked at the entrance on 7 February 1863. Wing had already warned the provincial authorities of the potential dangers, but nothing was done. Finally, after a near disaster in 1865, the Royal Navy banned its ships from using the harbour until Wing's suggested improvements were made. It was in Elizabeth GEORGE's large store adjacent to the Royal hotel in lower Princes Street, Onehunga, that the first concert was held in Onehunga on 30 September 1857. Elizabeth GEORGE gave the use of the building, and the proceeds from the concert, together with a personal donation, went to the Reverend Dr A. G. Purchas, vicar of St Peter's Church, Onehunga, to help towards the cost of building a stone schoolhouse. See the biography online: George, Elizabeth - Hotel owner, businesswoman, community leader. St. Peter's Anglican Church undergoes the first of many modifications. The first wharf was built with a stone abutment leading out from the foot of Queen Street to the wharf. 1860 to 1872 - The New Zealand Wars. Bitter fighting rages across the North Island for a decade, with Maori finally being narrowly defeated. For the biggest campaign, 18,000 British troops are mobilised against the Maori people, who do not number more than 60,000 men, women and children throughout the country. At Onehunga on 9 May 1861, aged 25, Mary Ann COLCLOUGH - Feminist, social reformer - married Thomas Caesar Colclough, a farmer of 54 or 55, first in St Peter's Anglican Church then in the Catholic church. See the biography online: Colclough, Mary Ann. When gold was discovered in Otago in 1861, "Maid of the Mill", captained by John GRUNDY, was the first ship to sail from Onehunga loaded with provisions and equipment for the goldfields. On 7 February 1863, the steam-corvette H.M.S. Orpheus is wrecked at the Manukau Bar. One hundred and eighty nine of the crew were drowned. Photo: Rev. 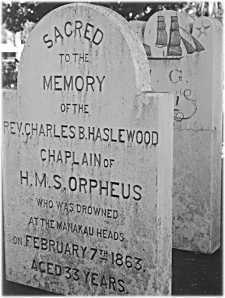 Charles B. HASLEWOOD's gravestone - Chaplain of H.M.S. Orpheus - St. Peters Church, Onehunga. The families of settlers in the outlying districts around the Manukau Harbour, threatened by the war in Waikato, fled to Onehunga for safety. Elizabeth GEORGE, distressed by their plight, set about billeting, clothing and feeding them, initially at her own expense. As the number of refugees increased she asked Dr PURCHAS to convene a public meeting. At this meeting the Onehunga Ladies' Benevolent Society was founded, with Elizabeth GEORGE as its first president. Matilda FURLEY was a foundation member of this society. It was to become the oldest institution of its kind in New Zealand with a continuous record of public service, and is one of the first recorded organisations of Pakeha women. In 1863 Samuel FURLEY was first recorded as the licensee for the Royal Exchange Inn in Princes Street. On 1st August, Catherine Ann ANDERSEN - Teacher, Community Leader, Writer - was born at Onehunga. See the biography online: ANDERSEN, Catherine Ann. In December 1873 a railway line between Onehunga and Auckland via Newmarket, Ellerslie, and Penrose was opened with great public celebration. From its opening the rail was extremely busy with passengers and cargo travelling to the port town of Onehunga. Reverend Dr. Arthur Guyon PURCHAS retired. The population of Onehunga had now grown to over two thousand. On 17 July 1877 James WILIAMSON b.1814 - d,1888 bought from Thomas RUSSELL for ï¿½10,000 a 313 acre estate near Onehunga, named Pah Farm, and set about building the most palatial gentleman's residence in Auckland, a two-storeyed Italianate mansion in plastered brick. The grounds were lavishly planted; even the stables and outbuildings were resplendent. There was a large retinue of servants: 'one could imagine oneself back in old England in an old county house', said a visitor in 1882. Understandably, locals called it 'Williamson's Castle'. In April, a Proclamation was issued by the Governor, the Marquis of Normandy, declaring the Town District of Onehunga a Borough under the Municipal Corporations Act of 1876. The Onehunga wharf was linked to Auckland by railway. Thomas BALL - Coloniser, landowner, politician - moved to Onehunga, Auckland, where he was a justice of the peace, as he had been in Mangonui. BALL had a vital interest in the establishment of a regular and dependable coastal service between Auckland and Mangonui: he was instrumental in the formation of the Northern Steam Ship Company in 1881, and was an inaugural director. He died on Christmas Day 1897. First burial at Waikaraka Cemetery. New Zealand women are the first in the world to vote in national elections. Mrs Elizabeth YATES, wife of the former Mayor, Captain Michael YATES, was successful in winning the Mayoralty, and Onehunga thus had the distinction of electing the first woman Mayor in the British Empire and by virtue of this office also the first justice of the peace. See the biography online: Yates, Elizabeth - Mayor, local politician. Donald Arthur SUTHERLAND became Mayor. He was born in Te Papapa and thus became the first New Zealand born Mayor in New Zealand. Sophia BATES died on 28 November 1899. On 30 November she was buried in St Peter's cemetery, beside her parents. She retired from teaching in the late 1860s, and took responsibility for the care of her elderly parents - Elizabeth Hix Bates died in 1874 and John Bates in 1886. Like her parents, Sophia was involved in the work of St Peter's Church and later in life presented vestments, communion vessels and a pulpit to the church. St. Peter's Churchyard closed for burials except for those with family plots. Sir John Logan Campbell gave Cornwall Park to the people of New Zealand in 1901, and it was formally opened in 1903. It is named in honour of the Duke and Duchess of Cornwall who were visting at the time of gift. Cornwall Park surrounds the major Auckland landmark of Maungakiekie or One Tree Hill. Maungakiekie translates as 'hill of the kiekie vine', and is a scoria volcanic cone built by lava fountaining from its three craters about 20,000 years ago. Campbells original home (the first wooden house), known as Acacia cottage, built in O'Connell Street, Auckland in 1841 was moved to the park in 1920. 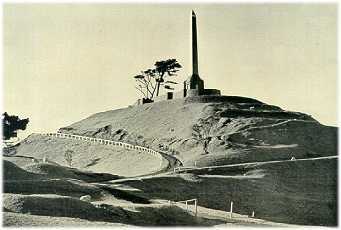 Campbell was buried at the summit of Maungakiekie in 1912. The provision of electric tramways between 1902 and 1956 allowed a considerable degree of suburban dispersal of population and the new series of suburbs grew up in the early 1900s along the main-line routes from the city. The rail-way fostered the growth of Onehunga, Otahuhu and small settlements to the south such as Papatoetoe and Papakura, and to the west including Glen Eden and Henderson. Reverend Dr. Arthur Guyon PURCHAS died, aged 84, in Auckland. Regional prohibition begins in parts of Auckland, including Onehunga. Closure and subsequent demolition of the Royal Oak Hotel, Onehunga. 15 September: Labour Party Leader Helen Clark said that she deplored the latest act of vandalism against the lone pine on top of One Tree Hill. For Aucklanders this tree has an iconic status. It is both a reference point and a symbol of our city. Whatever the pros and cons of the arguments being advanced by yesterdayï¿½s protestors, their cause can never be advanced by resorting to this sort of senseless destruction. I hope that the damage inflicted on the tree in yesterdayï¿½s attack can be reversed. If not, Auckland will lose one of its proudest and most recognisable landmarks. On 26 October One Tree Hill lost its tree. Officials decided to chop down the landmark tree after two chainsaw attacks by Maori activists left it listing dangerously. The Monterey pine was planted in the 1870s to replace a lone totara, a tree sacred to local Maori. In 1994 activist Mike Smith carried out a night-time chainsaw attack on the tree. He was stopped before the tree fell and efforts were launched to save it. Another attack in September 1999 left it unable to support its own weight. The pine, celebrated in the song One Tree Hill from Irish rock band U2's 1987 album The Joshua Tree, was removed by helicopter. Residents from Auckland gathered on the volcanic hill to watch as the tree came down. Auckland Mayor, Christine Fletcher, said: "I felt pretty sentimental - it is the repository of many of our memories." Please note that although every effort is taken, I cannot guarantee the accuracy of any information provided on this site. Please advise broken links, corrections, etc.